For those of you who don't already know, I got laid off from my job recently. Luckily, the company let us know 2 months before the actual date of severance, so I've had time to look for another job and, in fact, I have 2 very promising interviews next week. Once I got over the initial shock and panic, I realized that the worst thing that will happen is that I'll have to collect unemployment benefits for a while and I might have to borrow some money from relatives to help pay the bills. All things considered, that's not so bad. And, if I do end up "on the dole" for a while, at least I'll have more time to knit and blog. In any case, my misfortune hasn't stopped me from knitting. 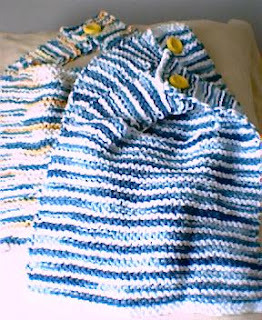 I'm done with 3 bibs for my nephew and have started a 4th. I plan to do 5 in total and to have them ready for his half-birthday in April. Being jobless also hasn't stopped me from buying more yarn. A couple weeks ago I made my first trip to Knitwerks, a lovely new store in the south Loop. The owner of the store is extremely friendly and helpful. The store isn't big and the selection is small, compared with some of the other stores in town, but I still managed to find several gorgeous things. Naturally, I couldn't buy everything I liked, so I settled on 3 balls of yarn. For some reason, I gravitated toward olive green and decided to go with that. The one at the top is Super Kid Seta by Trendsetter Yarns, the one at the bottom left is Dune (also by Trendsetter), and the one at the bottom right is Gioiello by Filatura di Crosa. I haven't decided yet what I'm going to make with them. 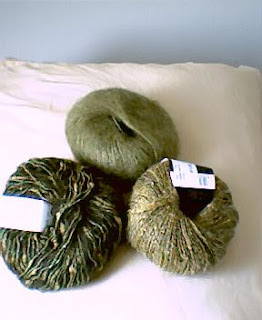 I might combine them with that olive green silk by Tilli Tomas that I bought at Stitches Midwest and just make a scarf. You can never have too many scarves. My first thought was to try to blend the yarns together, but now I'm thinking I might just do large chunks of each, to make the contrast between textures more pronounced. Whatever I decide to do, I'll post a picture when it's done so you can see the results.